New research led by Dr Sofie Pelsmakers (Sheffield University, London-Loughborough Centre for Doctoral Training Alumni) and Dr Cliff Elwell (UCL Energy Institute, LoLo CDT Deputy Director) highlights that heat loss from suspended timber ground floors in pre-war housing can be reduced by 65% to 92%, depending on insulation method. Given that there are around 10 million suspended timber ground floor constructions in the UK and millions more globally, the impact of retrofitting insulation on floor heatloss could be significant. However, while floors often remain uninsulated due to the disruption of retrospective works and assumptions of originally low heatloss, this study highlighted potentially significant heat loss reductions because the original heatloss of the floor was also significantly underestimated, therefore underestimating the benefits of insulating the ground floor as previously reported by the same research team. 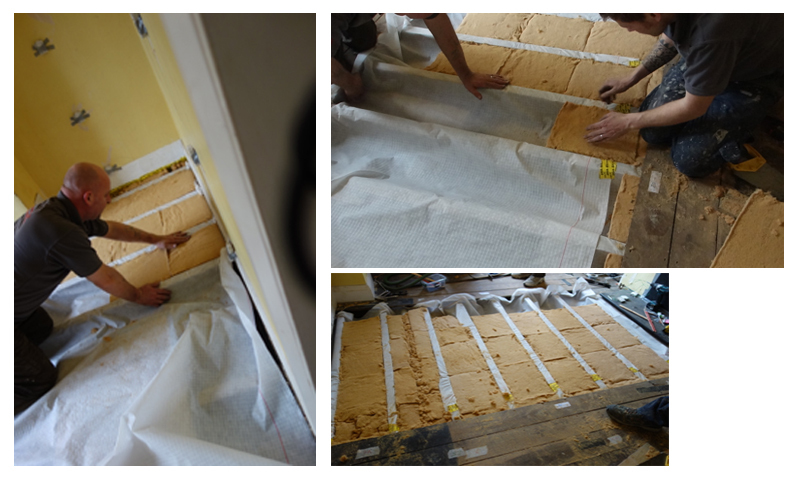 In this study, the researchers, undertook a detailed investigation of a UK case study dwelling with two practical and buildable interventions: fully-filling the floor void with EPS beads, and 100 mm woodfibre insulation between the joists. The performance of both interventions was monitored in 27 locations on the floor, allowing for comparison with the uninsulated floor and with modelled results. In this detailed case study, the average floor U-value dropped by 65% for the woodfibre insulation installation in between the joists and 92% for bead-insulation in the entire 350mm floor void, which also benefited from sealed airbricks. It should be noted that sealing airbricks over time could lead to moisture build-up and further research is needed in this area. A disparity between the in-situ measured and modelled performance was observed; this gap reduced the better insulated the floor was. The research team also stress that installation quality is essential to maximise heatloss reductions, and illustrate the importance of tight-fitting insulation between joists and floorboards. Given that the UK is committed to a target of 80% CO2 emission reductions by 2050, the retrospective insulation of suspended floors could significantly contribute to these ambitious goals. Dr Pelsmakers said: “Our detailed case study results suggest there might be a significant benefit from insulating suspended ground floors, but a wider reappraisal of the performance of suspended timber ground floors is needed to fully understand the potential for the country’s carbon emission reduction targets. At present the existing assumptions in public policy and building regulations might be incorrect, and the benefits of insulating the ground floor therefore might be underestimated, which means that the benefit of insulating floors could be much greater than expected, such as greater space heating energy use savings (and associated carbon emission reductions) and increased thermal comfort. This research was made possible by support from the EPSRC Centre for Doctoral Training in Energy Demand (LoLo), grant numbers EP/L01517X/1 and EP/H009612/1. The authors are grateful to the homeowner for access to the case-study house and to the Energy Savings Trust (EST) for lending of additional instruments, to NBT and Downs Energy for intervention-study support and donation of materials in support of this study and to Downs Energy for installation of the interventions.